We thought our eyes had deceived us...here is a 3/16x 7/16x 1-7/8" tall Arkanasas rock crystal. So far so good. Then we noticed it's an Extremely Rare Dogtooth crystal - that's when 4 opposing sides are +/- equally wide, and the remaining 2 opposing sides are quite thin resulting in a diamond-shaped crystal. OK! we thought, a real rarity. Then we saw a MANIFESTATION crystal in it. More and more rare. 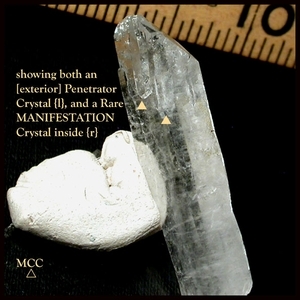 It's when a complete crystal [or crystals] has formed completely inside the host. 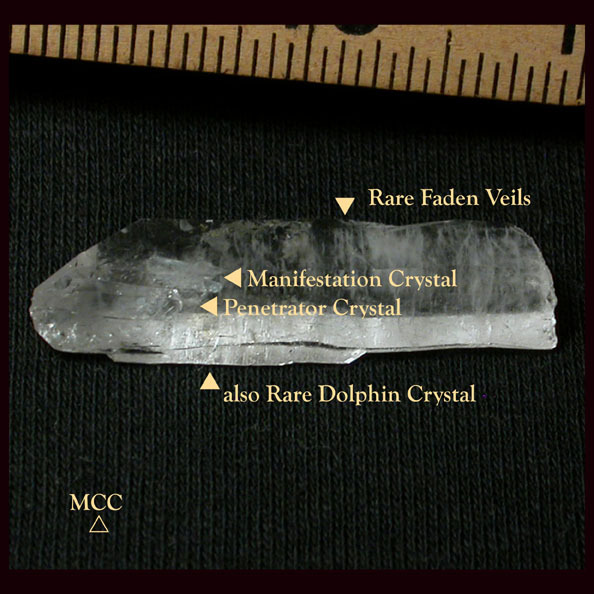 We saw it by noticing a penetrator crystal which makes the main crystal's termination a twin...and THEN we saw the CURVED really rare DOLPHIN crystal riding alongside...which led us to notice the RARE FADEN veils that rarely and usually only are in tabular crystals...and record keepers and rainbows, of course. One main face is partially regrowing opposite the fine Isis main face - this is reflected in the low price for this stone. Put your wishes out there for the good things to come to your life and those of whom you love and wish to help as you hold this stone and keep it with you! Would, of course, make an outstanding pendant.